With just a couple of days to go before CCR host their first international home bout we took some time out with the clubs founder members and early joiners to reflect on the journey they’ve been on since Roller Derby with Central City Rollergirls was just a twinkle in Twisted Mister’s eye. We talked to Ouija Broad (founder member and Centrinnians player) Verry Cherry (Steering Group member and Centrinnians player), Twister Mister (founder member and reknowned bout announcer) and Nancy Spinatra, (Centrinnian’s Captain for two seasons and now on the UKRDA Board of Directors). 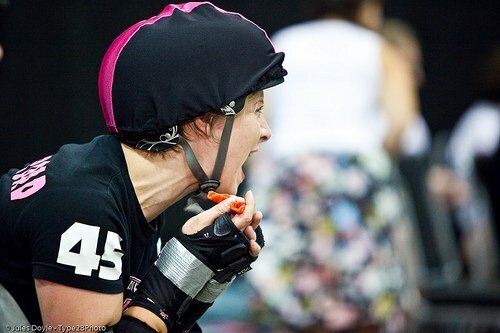 They gave us some insight into where CCR have come from and what the upcoming bout means to them. When CCR started up, what did you want it to achieve/grow into? OB: It was important to nurture a democratic club where skaters had equal share of running the club. TM: Something that was fair, fun, and looked after the needs of the individual as well as the majority. Above all a place people wanted to come to get fitter, make some friends, and actually play the sport, not just wear the t-shirt. VC: We wanted to be taken seriously, a force to be reckoned with, not just fishnets and cupcakes! What were the biggest problems you encountered when setting up the club? OB: Making sure we kept committed enough to secure venue bookings. Venue hire was a struggle from week to week. There wasn’t much availability and some venues were expensive. We started practising once a week and had a committee of people approaching venues. NS: We were really lucky to have someone on board with a great business mind in Dynomite Bo. She set us up as a not-for-profit organisation, liaised with venues and set up our proper bank account and dues paying system. What do you think CCR’s strengths are that helped the club grow? NS: We struck lucky with people who joined the Steering Group [Twist and Ouija started organising and structuring the league more when CCR had around 30 girls, the Steering Group were formed as an overseeing body as a result.] VC: Everybody wanted to do jobs and we split roles up based on our strengths. I even got my day job now based on work I did at CCR, I took over organising the CCR fundraisers 8 months after I started. TM: We have people that are not afraid of a bit of hard work and folks involved that put a lot of spare time, effort and passion into making it what it is. Was there ever a make or break point/turning point? OB: I’ve never doubted that it would work out – Twist has been relentless on recruitment from the start, the rest of the team and coaching structure have all helped out. Most of the founders have actually left now but we’re still growing. TM: We’ve been lucky to avoid drama and I think that the environment we maintain at practice doesn’t allow too much of those kind of troubles to manifest. NS: There was a notorious coach trip once coming back from Glasgow, we ran out of petrol, I think we were in Cumberland, or Northumberland… Somethingland… VC: It made me never want to go on a minibus again! It bought the team together in the end though, a bonding experience. Do you have any advice for leagues just starting out? VC: Appreciate the people around you, everyone builds the league. OB: Be prepared for hard work. You have to have a love for it. Don’t take it on on your own, and make sure you have the support. TM: Don’t fall foul to founder syndrome. It seems to be a problem in Derby. Don’t forget it’s going to be hard work to get where you want to be, STICK AT IT!!! What has been your personal proudest moment at CCR? NS: When I was MVP for our team at Roll Britannia in 2009 and Captain of our Travel team 2 seasons running. But there are loads of things, and a load happening now, our intra-league development is very exciting. TM: The Grange Hell Boot camp, as it started off as a conversation in a supermarket car park between myself and Ouija Broad, and then became a reality and a success. VC: The amount of fundraising we’ve done for CCR and charity; being intraleague captain – I’m really proud of this because it shows people have faith in me – I’m not the best player or the star jammer but have got something to bring; making the Centrinnians roster – I’ve worked really hard for this. What has CCR achieved as a league that you’re have been most proud of? OB: I’m really proud of our ref squad – they are like gold dust! They, and the coaching structure work very hard and they aren’t taken for granted. NS: We’ve helped out leagues advice wise and are a founder member of UKRDA which is for all skaters. We never refuse help, always try to be fair with rosters and are always evolving. We’ve recently been accepted into the WFTDA Apprentice Scheme. Stevel Knievel drove our WFTDA apprentice application, he told us what we needed to do and we did it! VC: For me it’s some of the wins that people weren’t expecting, particularly away wins. We have team England representatives and our zebra crew and NSO’s are highly respected, often asked to help out in other peoples bouts. On Sunday, CCR hosts their first game against a team from the US, what does this mean for you? OB: I’m scared and excited but I couldn’t be with a better team going into it. Over the past few months the blending of our up and coming skaters has become a smooth transition, were going to have the right attitude and it’s a hell of a trip but were learning loads all the time. And it’s one step closer to being a full WFTDA member! VC: It signifies how far Roller Derby in the UK has come along and you have to give props to London Roller Girls for that one. For CCR it’s amazing – of all the teams in the UK that they could have chosen to play, we want to step up and are ready to take on the challenge. And what’s next? What are your plans for the future? TM: To keep on going at it, so when I finally retire and hang up my and skates I can look back and think “Yeah, I did something good there, something to be proud of.” OB: Continuing to play – there is always room for improvement and continuing to be involved with our intraleague teams. VC: To keep going onto bigger and better things – our A and B teams along with our rookies are taking on the best and learning. NS: Continue through links with UKRDA to pioneer UK derby and keeping our core values. CCR spreading the love has always kind of been an unofficial mission statement.